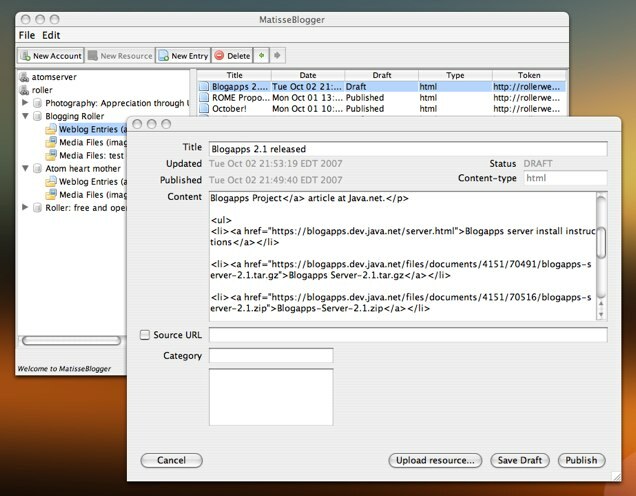 The next releases that I'd like to announce are the Blogapps 2.1 Examples and the Blogapps 2.1 Server. The Blogapps project hosts a collection of useful RSS and Atom utilities and examples from RSS and Atom In Action by Dave Johnson. They're designed to be useful even if you haven't read the book and they're available under the Apache License 2.0 so you can use the code in your applications and you can modify and redistribute them as you wish. What's changed since 2.0? The examples have been updated to include the latest version of ROME Propono, which means that most of them now support the final Atom protcol spec. The server has been updated to include Roller 4.0 RC5, which also includes Atom protocol support and JSPWiki 2.4. And of course, various bugs have been fixed. Here are the release files, installation instructions and release notes. This blog entry was posted via Atom protocol and the MatisseBlogger blog-client, which you can see in the screen-shot below (which was also posted via Atom. What's next? Not sure at this point, but I will do another Blogapps release once ROME 1.0 is released. I guess the FileCaster webapp and Propono's file-based AtomPub server would make sense in the Glassfish Update Center, but most of the other Blogapps examples are command-line utilities so it's not clear that they belong there. Or did you mean the Netbeans Update Center?